Motivational Monday #3: Do our dreams create our future? A few weeks ago, I received a package with some lovely birthday presents from my Auntie who lives in Australia. 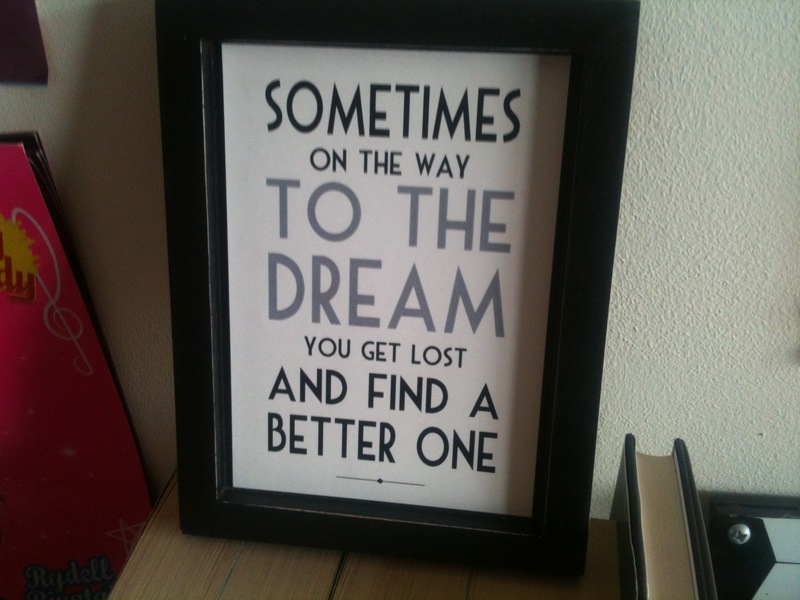 One of the items in the package was a photo frame with a quote printed inside: “Sometimes on the way to the dream, you get lock and find a better one”. This really got me thinking. My auntie, you see, somehow manages to know me so well even though she lives on the other side of the world and it totally explains my current confusion on my future. Just over two years ago, I started my first ever YouTube channel. I remember uploading my first video to “ShaunyinWonderland” very clearly. It included me filming myself in my pyjamas on my bedroom floor talking about very random things and making really random facial expressions whilst miming along to “One Short Day” from Wicked. After about four videos and pretty much everyone in school having seen me make a fool of myself, I deleted the channel. Surprisingly, it wasn’t because I was embarrassed I don’t think because everyone genuinely seemed to find them quite funny to watch but I think it was because I just didn’t find it very good fun having to edit videos so much. I’m glad I made this YouTube channel though and let everyone know what a fool I was because this actually made making the YouTube channel I have now two years later a heck of a lot easier to share around. “Shaunyland” was an idea that I had at new year because I knew that I wanted to try it again for a long time. Originally, it was to be called “PinkBluebells” but someone alreayd had that username. Now, four months later, here you are reading this blog post. Luckily, PinkBluebells was finally available again so “Shaunyland” is out of the window. One day, I really hope that this blog will really hit off one day. But until then, I’m just going to have to keep on working with it. I really hope I end up doing something that I want to do. I’m happy I’m keeping my options open now instead of narrowing my life down. Maybe one day I’ll be able to do both. Theatre really is my core, though. But until then, I’ve got to keep working for it. Because who knows what dream we end up living?..